Propagation of electromagnetic waves in areas with a low density of buildings depends mainly on the topography and the land usage (clutter). The vector data of the buildings must not be considered in such scenarios. 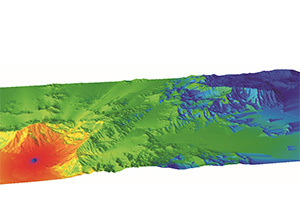 A wide selection of propagation models for these scenarios based on topography and land usage (clutter) are available in ProMan. As these models are very flexible they can also be used where no vector building data is available in urban scenarios. Generally the usage of topography and land usage without any further vector building data is recommended if the transmitting antenna (basestation) is located on a hill (or very tall building/mast) and if the propagation in the vertical plane between Tx and Rx is dominating. The topography of the scenario has a very strong influence on the propagation of the electromagnetic waves. 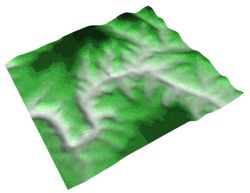 Therefore a detailed topographical database is mandatory for the propagation models. Additionally to the topography, the land usage (water, roads, buildings, forest,...) influences the propagation of electromagnetic waves. Therefore land usage (clutter) databases can be used optionally to improve the accuracy of the path loss predictions. Clutter databases should have the same or even a finer resolution as the topographical database. In ProMan the user can define frequency dependent losses for each clutter class - these clutter dependent losses can be calibrated automatically with measurements. Besides these frequency depending losses also the height of the objects in each clutter class can be defined by the user (this is important for the Knife-Edge Diffrcation model). The clutter classes can also be used to control the selection of propagation models (e.g. selection of submodels of Hata-Okumura model) and the electrical properties of the ground can be defined for each clutter class to improve the accuracy of the ground reflected ray in the deterministic two ray model.